His smile wreaks havoc and touch causes chaos. Kaya doesn’t know what to do, as her ‘treacherous desires’ take hold. However there is an invisible barrier of ‘marriage’ that Kaya cannot break. Torn between her failing marriage and the man who is irresistible, Kaya now has the hardest choice to make. 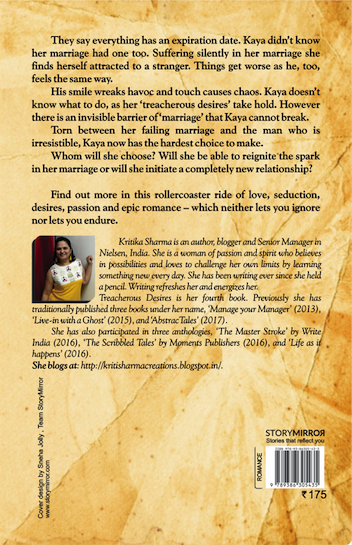 Kritika Sharma is an author, blogger and Senior Manager in Nielsen, India. She is a woman of passion and spirit who believes in possibilities and loves to challenge her own limits by learning something new every day. She has been writing ever since she held a pencil. Writing refreshes her and energizes her. Treacherous Desires is her fourth book. Previously she has traditionally published three books under her name, ‘Manage your Manager’ (2013), ‘Live-in with a Ghost’ (2015), and ‘AbstracTales’ (2017). She has also participated in three anthologies, ‘The Master Stroke’ by Write India (2016), ‘The Scribbled Tales’ by Moments Publishers (2016), and ‘Life as it happens’ (2016).